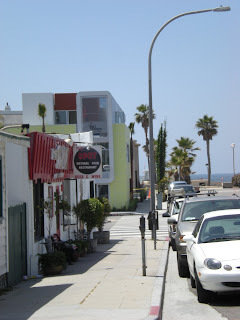 The Spot is a vegetarian restaurant in Hermosa Beach. It has been around forever, but I just discovered it. Here is a picture of the restaurant. Yes, it is just a block away from the beach. I don’t work that close to the beach, it’s about a 10 minute drive. I went there for lunch today and started with some Split Pea Soup. 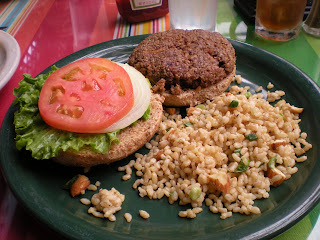 They are not only a vegetarian restaurant, but a very healthy place all around. 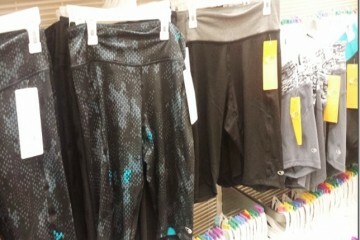 They only use whole grains and brown rice and have many low fat/ fat free options. 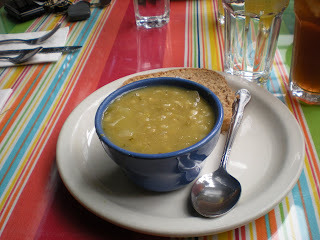 The Split Pea Soup, like all their soups, is fat free. It was served super hot – just the way I like it. It came with a piece of freshly made bread. For my main course I had a Spot Burger. Their burger patties are delicious. They are made with beans, nuts and grains. It is so much better than those super processed veggie burgers I get from the market (not counting Amy’s of course). 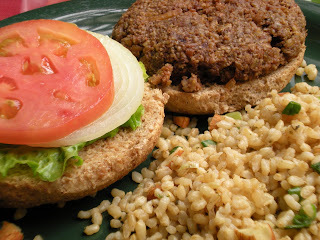 The burger came on a whole wheat roll with almond rice. It was brown rice with onions, seasonings and almonds of course. The rice is served cold so it is like a rice salad. I left about 1/3 of the bread from the soup and half of the bun from the burger. The patty is the best part and I wanted to savor it on it’s own. This place is my new favorite restaurant. I have only been there twice and want to go back and try everything on their menu. Not at the same time of course! 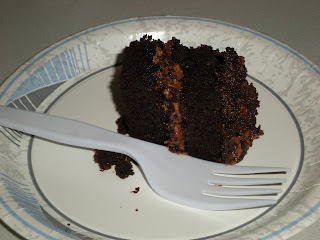 To cancel out my healthy lunch I had a bite of chocolate cake. It was for a farewell party at work since it is some one’s last day. The cake was not very good and even though it was a tiny piece I threw it out after one bite. Not worth it.